In website builder WebWave button "Like it!" allows users to like your website. It also helps you keep track of your website popularity. In this article, you will learn how to build a website with the Like button. Button"Like it!" can be added from the toolbar on the left side of the builder. 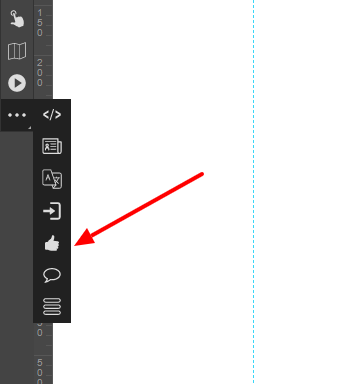 All you need to do is select adequate icon and drag and drop it to your website. After clicking on "Like it" button, you will find in the Settings panel "Like it! plugin settings" section. You can select if the counter should calculate likes on a current website or certain URL address. Allows you to decide whether the number of likes should be displayed, and if so, on which side of the button. Choose between two available "Like it!" button styles supported by Facebook. You can decide whether next to "Like it!" button should be displayed "Share" option.